Finding the best electric chainsaw for your needs can be quite a challenge nowadays, especially with the various options available in the market. 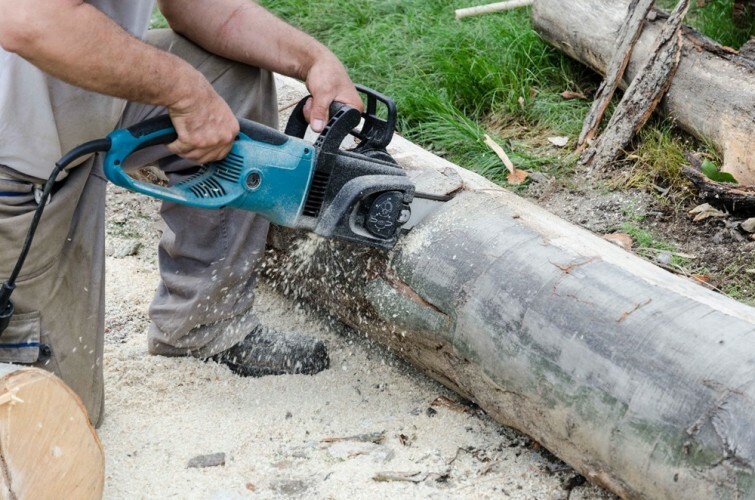 Aside from choosing from the different brands of electric chainsaw products, there are also two main types of electric chainsaw that you have to choose from – corded and cordless. 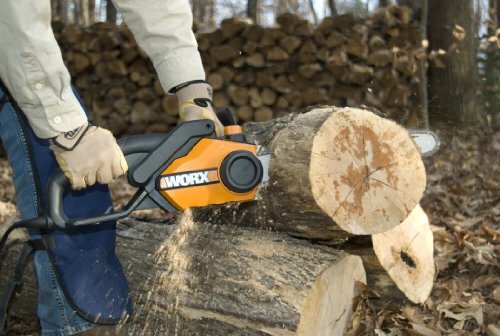 The Worx WG303.1 is a corded electric chainsaw that uses a 15.5A electric motor to power its machine. It features a rubberized handle for easy-full grip and comfort while working. The bar and chain measure 16 inches and are suitable for light to moderate woodwork. The chain of this machine comes with an automatic chain tensioning system, making the chain adjustment process faster. This automatic feature helps control the tightness of the chain to avoid the machine from malfunctioning, resulting in better cutting performance and a prolonged lifespan. Aside from the auto chain tension, it also includes an automatic lubrication system and chain brake which both help in keeping the chainsaw efficient and safer to use. If you are looking for an electric chainsaw for medium-duty woodwork, then the Worx WG303.1 is definitely worth checking out. It is appropriate for cutting down branches or limbs of up to 14 inches thick. If you are maintaining a small backyard garden, this product can definitely help you efficiently with all the trimming and pruning jobs, making them easier and quicker. The Makita UC4051A is the updated and upgraded version of the Makita UC4030A. This electric chainsaw has a 15A electric engine that powers its 16 inches bar and chain. It weighs about 12.3 pounds, it’s highly versatile and easy to use. This product can accommodate light to medium-heavy-duty woodwork. 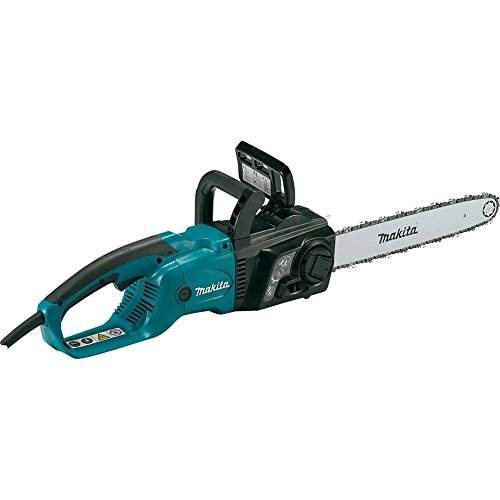 The Makita UC4051A can easily cut through up to 14-inchs of wood such as firewood and fallen trees, perfect for most jobs around the home garden. Makita UC4051A requires the use of an extension cord measuring 50 ft. going up to 100 ft. A 100 ft. extension cord will need a 10-gauge rating while a 50 ft. extension cord requires a 12-gauge rating. It is important to follow this extension cord requirements to ensure safe use of your electric chainsaw as well as uninterrupted power. Makita UC4051A features a trigger lockout which keeps it from getting accidentally activated. It also has a chain catcher to protect you from the chainsaw in case it accidentally breaks plus other additional safety features such as chain brake and run-down brake. There are also front and rear guards purposely built to protect you from any flying wood debris that might come your way. These safety features combined with its well-built metal components make it one of the top performing machines in the chainsaw world at this price point and indeed in this test. The Black and Decker LCS1020 is a cordless chainsaw powered by a 20-volt battery. In effect this is the lowest powered chainsaw on test. It is also the lightest and weighs only 7.2 lbs, making it very light and ideal for all-around home use. The chain and bar it uses are a high quality Oregon low-kickback model measuring up to 10 inches. It is made with a blade tensioning system that does not need any tools to adjust, saving you more time while simultaneously increasing your cutting efficiency. The blade tensioning system also means as a user you need less expertise to use this product. Many chainsaw users appreciate the Black and Decker LCS1020 because it’s lightweight, well-made, plus it offers comfortable handling features. These features help in finishing the work faster and more efficiently. However the small 10″ bar provides only limited cutting power. This might be fine for day to day tasks around the yard but for anything more arduous you may want to choose something more powerful. If you only want an electric chainsaw for occasional and light duty purposes, then the Black and Decker LCS1020 is one of the best options you can buy. It comes at a cheaper price and can accommodate your pruning and small trimming jobs with ease. 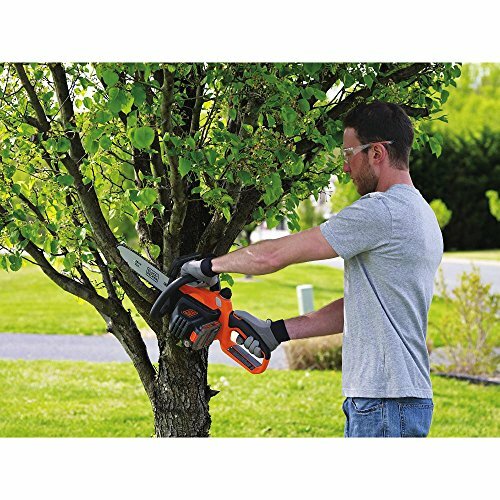 The Oregon PowerNow CS250 is a cordless chainsaw and comes with a 40 V battery to power its 14-inch chain and bar, this is 2″ smaller than both of the corded models in this test but 4″ larger than the B&D. It’s also twice as powerful as the B&D. It can cut to up to 10 inches of wood and when fully charged can let you cut up to 250 branches measuring 2-3 inches in diameter. The thicker the diameter you’re working on using this chainsaw the faster you’ll exhaust the charge of the battery. One special feature of this electric chainsaw that you cannot find in any of the other models reviewed here is its built-in sharpening system. This feature will allow you to sharpen your dull chain in just a few seconds. The Oregon PowerNow CS250 is highly efficient and operates with minimal sound. It only weighs 11 pounds to give you utmost comfort while pruning or limbing wood around your property. 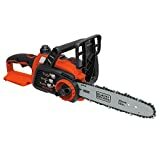 Utilizing this chainsaw does not require any complicated rituals such as heating up or mixing oil. Since the Oregon PowerNow CS250 is battery powered, all you need to do is keep it fully charged so you can immediately resume with your work. One of the top safety features of this chainsaw is its trigger feature, which automatically stops the chain from moving once the trigger is released. This is a worthy safety feature. 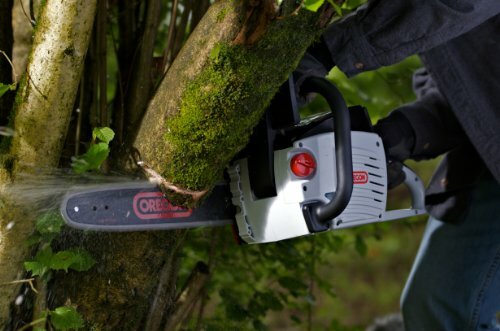 The Oregon is a very good portable chainsaw, if you can live with the lower power and cutting capability then this will be an excellent choice for around the home. It would also be a good idea to purchase at least 1 spare battery if you have extensive pruning to undertake. The list of the best electric chainsaw reviews provided here, are some of the most recommended machines in the market for light to medium duty use. Oregon PowerNow CS250 is one of the best electric chainsaws on the market that is packed with all the features you’ll need for light to medium-heavy cutting. However, you must note that like any other battery operated chainsaw this product is restricted by its limited battery capacity. Nevertheless, an extra battery should be enough to solve this problem and this product is our best electric chainsaw of this test. The Black and Decker LCS1020 with limited power and shorter bar should only be an option for those that might use it a few times a year. If you plan to use a chainsaw any more than that then consider something with more cutting power. If you’d prefer the corded electric variety with constant power then both the Worx WG303.1 or Makita UC4051A are good options. The Worx WG303.1 is a budget model packed full of automatic features that will keep the infrequent user safe as well as the product itself in good condition. The Makita doesn’t have as many features but it incredibly well built and will probably outlast many of the models on test here. With both corded models you should adhere to the requirements of the extension cord specifications for safe and consistent use.